Stop buying over the counter drives! 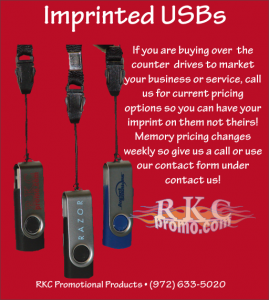 If you are buying over-the-counter USB drives for sending data to your customers, stop! It’s important to keep your logo in front of clients. They may erase the data from a standard drive but your logo will remain on the case. Did I mention that you can have data pre-loaded and locked on the drive? My clients are currently using data for a variety of purposes but they are great for training and marketing materials, product catalogs, transferring files and much more. Memory prices change weekly and prices are lower now than they have been in well over a year. The quantity also affects the price but you don’t have to buy them in the 100’s but you will pay more for smaller quantities because of imprint setups. Click on the picture to see a selection of drive styles. There are also a lot of other electronic products available in the promotional products market so click on the link to see a selection of them as well. If you’re looking for something you can’t find, give us a call. We’ll do our best to track it down for you. Subscribe to our email list for specials!